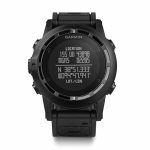 The Garmin Tactix is a sports-themed smartwatch designed for multi-sport and extreme athletes. More specifically it�s designed for high-altitude activities, like climbing. It�s equipped with an altimeter, barometer and compass. It also has built-in GPS and uses the Garming Tactix system to track waypoints, rally locations, and trails. The body is water resistant up to 50 meters.